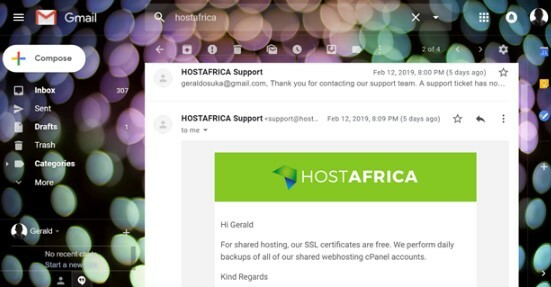 HOSTAFRICA Review 2019: Is HOSTAFRICA a Good Hosting? Based in Cape Town, South Africa, HOSTAFRICA offers a wide range of web hosting solutions. HOSTAFRICA is run by a team of highly skilled developers and managers from South Africa and Germany. In fact, Marcel Chorengel, one of the company’s founding members, helped to launch one of Germany’s largest providers of virtual servers and even pioneered the first fully automated web hosting software, Confixx. The company is based in Cape Town, South Africa, and has servers both locally as well as in Dusseldorf, Germany. Services and support are offered in English. If you’d like to set up a more advanced website, HOSTAFRICA’s higher-tier plans get you unlimited web traffic, up to 11 websites, 40GB disk space, unlimited MySQL databases, and free setup. Those with no coding or technical background can take advantage of the beginner-friendly website builder. This is a separate subscription. Additionally, you’ll find the one-click app installer very handy. This will enable you to deploy countless apps and scripts on your websites with ease. You’ll be able to add WordPress, Joomla, Drupal, Magento, and many more — without having to figure out server permissions, databases, and all the other technical bits. HOSTAFRICA’s servers are based locally, so if you’re catering to a local clientele, this should get you the best performance. Alternatively, if you have international traffic coming to your website, the company also has a data center in Germany. Servers run on RAID5 SSD storage as well as the latest Intel processors, so you’re assured of fast loading speeds and excellent availability for your website. Taking into consideration the features and services you get at HOSTAFRICA, it’s definitely worth the price you’ll be paying. The rates are slightly above the market averages, but you get excellent value for money here. Sadly, the company doesn’t have a lot of promotions or discounts. It does offer a 14-day money-back guarantee though. You’ll find that HOSTAFRICA’s website is very easy to navigate and gives you detailed information on what every service includes. There’s also excellent pre-sales guidance, enabling you to choose the best plan for your needs. The company has monthly and annual billing terms with payments done through debit orders or credit card. 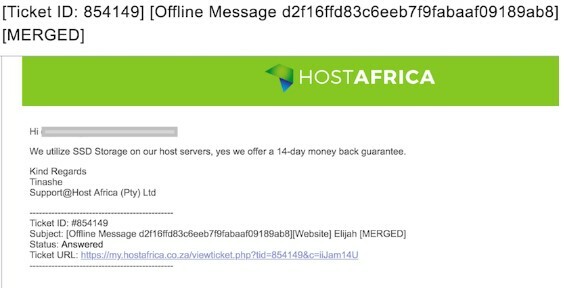 HOSTAFRICA offers 24/7 customer support via email, tickets, Skype, and phone. The team is also available on live chat, but this is not 24/7. I found that when I contacted them via email, they were very prompt in getting back to me. It took them about nine minutes to respond with a well-crafted answer. HOSTAFRICA offers fairly all-inclusive packages and good value for money. If you’re looking for a reliable provider in South Africa, you’ll find excellent service here. 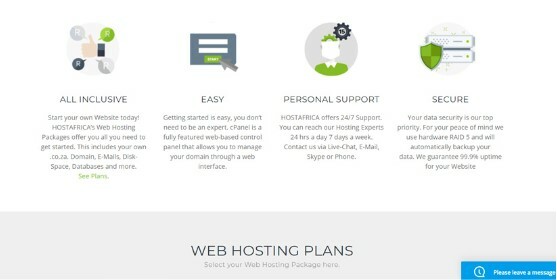 Wondering how HOSTAFRICA stacks up against other Web Hosting companies? Enter any other Web Hosting company and we will give you a side-by-side comparison.